Frank Bongiorno has won the $10,000 ACT Book of the Year award for his The Eighties: The decade that transformed Australia, with Robyn Cadwallader’s novel, The Anchoress, picking up a Highly Commended (along with $2000) as well as the People’s Choice award. Both were on hand for the announcement and presentation by ACT Arts Minister Gordon Ramsay at Canberra Contemporary Artspace during last night’s ACT Writers Centre’s annual Christmas Party and ACT Writing and Publishing Awards. 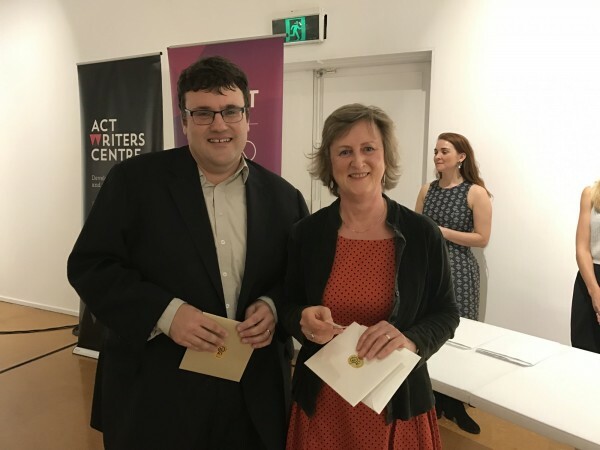 The other major award of the night, the ACT Writers Centre-managed $5000 Anne Edgeworth Fellowship for a writer under the age of 35, was presented to a delighted Rosanna Beatrice Stephens. Ms Stephens will use the fellowship to travel to Chicago and work with the The Second City, an improvisational comedy enterprise whose alumni include Jim Belushi, Joan Rivers, Dan Ackroyd, Julia Louis-Dreyfus and Tina Fey. Mr Ramsay said the ArtsACT-funded Book of the Year Award recognised quality contemporary literary works by ACT based writers. All shortlisted authors received $1000. “In selecting the winning entry, the judging panel unanimously agreed that The Eighties encapsulates a decade through a readable blend of scholarship and memory,” Mr Ramsay said. The Anchoress explores issues of gender, power and religion and the panel noted the book as an emotionally-engaging, assured debut novel. “There were 39 entries across fiction, non-fiction and poetry for this year’s awards which is a fantastic example of the creativity that exists in our community,” Mr Ramsay said.